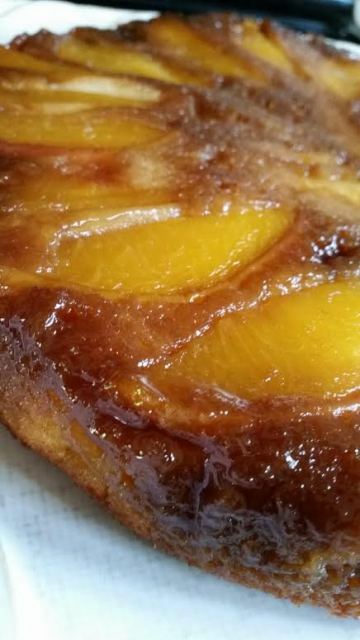 Wonderful Caramelized Upside-Down Peaches over a light and fluffy cake. Move over pineapple, peaches are in town! I have been checking off my bucket list of things to do this summer. On the top of my list is a visit to the Amish Country Store and Charcuterie in Maine. As I was checking out, I overheard another customer asking when the peaches were being delivered? As in Fresh Peaches? I skipped over to the desk and placed my order. Flash forward two weeks, a call came in telling me my peaches were ready to be picked up! Hooray! While my family was visiting, I thought we could all take a trip to see the Amish Country store and pick up my peaches. A CASE of peaches! The largest sweetest peaches I have ever eaten. 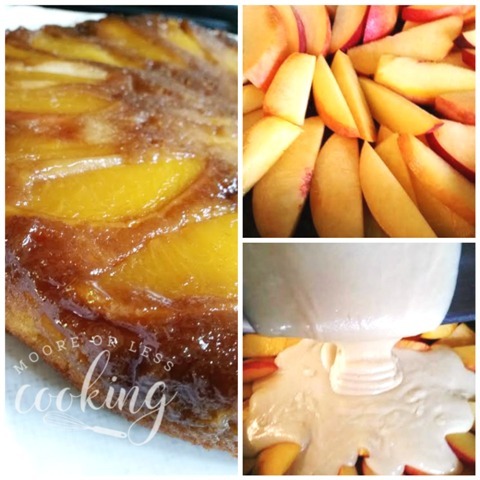 I started writing out my list of peach desserts that I wanted to make this summer, with an Upside Down Peach Cake coming in first! My grandson was celebrating his birthday, so I thought the cake would be a great addition to the party. 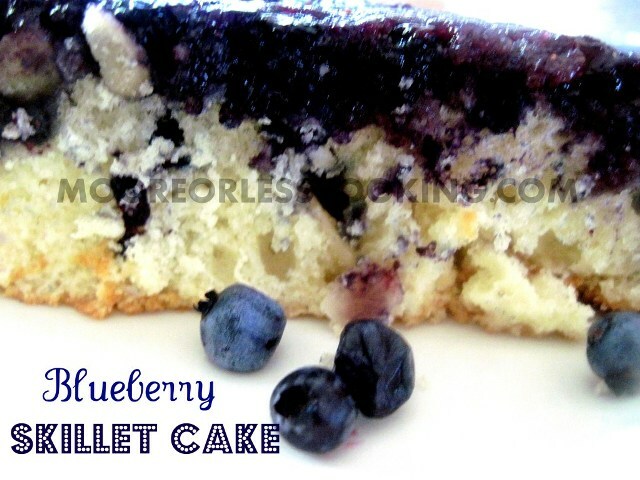 15 guests with happy bellies and many rave reviews for this luscious cake. 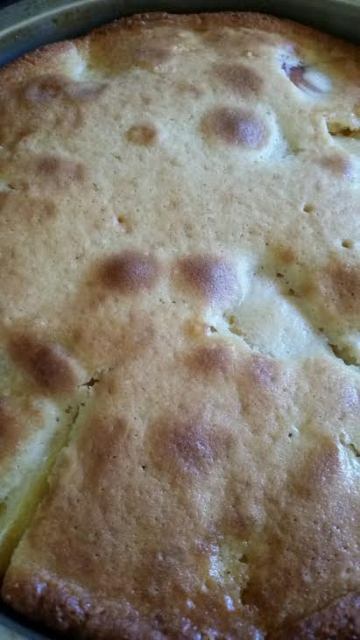 My daughter in law even requested that I make this cake again ASAP! With a case of peaches in hand, get ready for more peach recipes to come! Melt butter. Pour into an un-greased cake pan. Sprinkle with brown sugar. 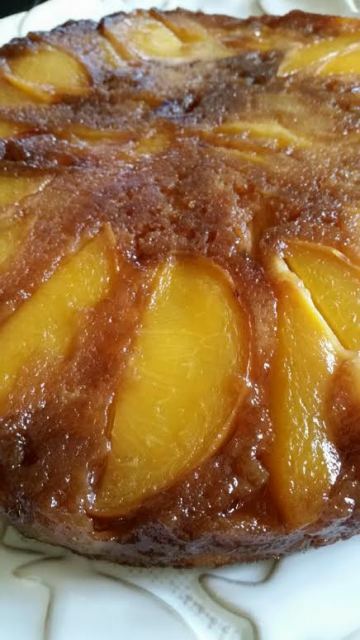 Arrange the peaches in a single layer over the butter and sugar mixture. In a large bowl, cream white sugar and butter until light and fluffy. Beat in an egg and vanilla. Combine flour, baking powder and salt. Add dry ingredients to the creamed mixture, alternating with the milk. Beat well after each addition. 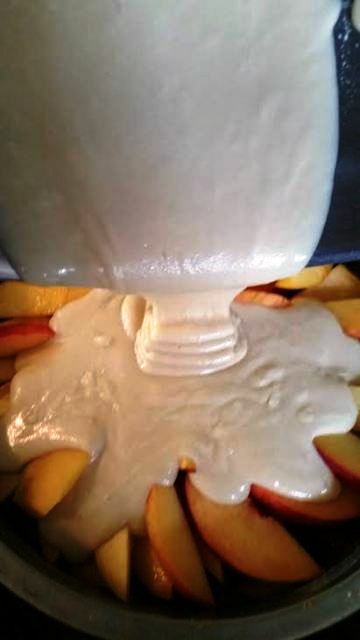 Spoon batter over peaches. Bake at 350 for 45-50 minutes or until a toothpick inserted in the center comes out clean. Let cool for 10 minutes. 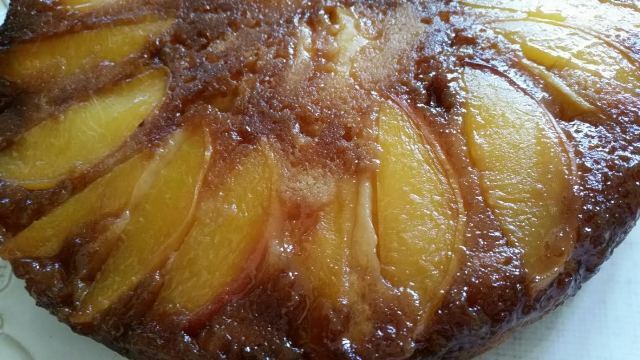 Wonderful Caramelized Upside-Down Peaches over a light and fluffy cake. Melt ¼ cup butter; pour into an ungreased 9-inch round baking pan. 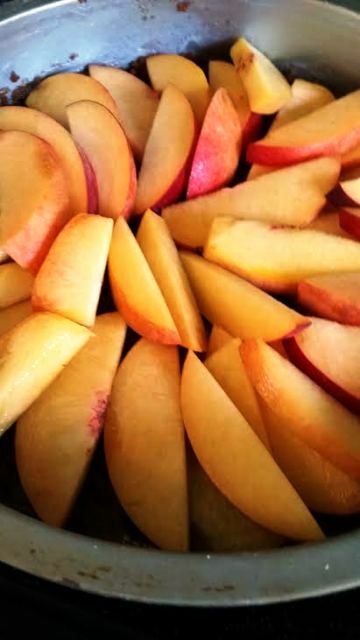 Arrange peach slices in single layer over sugar. In a large bowl, using a whisk or electric hand mixer, cream white sugar and remaining butter until light and fluffy. Beat in one egg and vanilla. Combine flour, baking powder,and salt; add to creamed mixture alternately with milk, beat well after each addition. 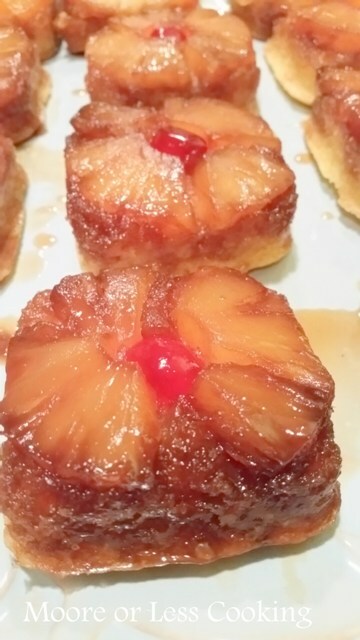 Bake at 350° for 45-50 minutes or until a toothpick inserted near the center comes out clean. Cool for 10 minutes before inverting onto a serving plate. Drooling! 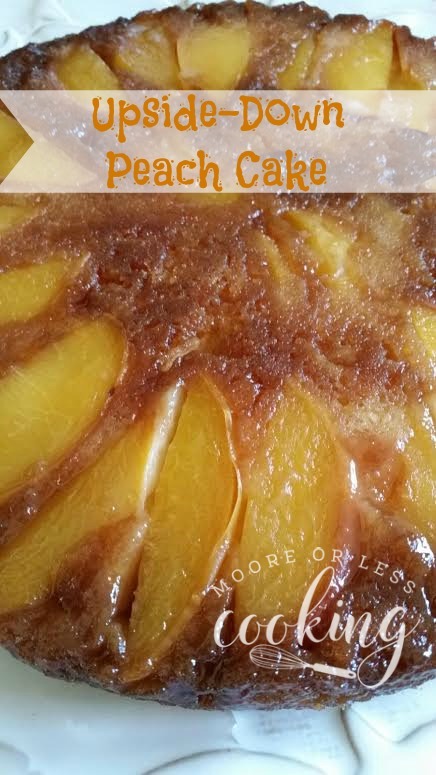 I love peaches and I must make this before the peach season ends. Pinning and sharing!